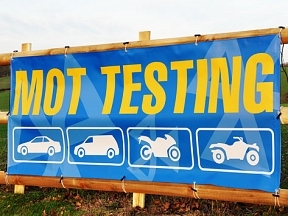 Bespoke Commerical Grade Printed Outdoor Business Banners. All sizes available, use the calculator below for prices. FREE Design- Contact the designers by Email or Phone for a FREE Design & Proof. Or Try The Design Online- Pick your size > Add to basket > Design Online > Pay > Receive next working day! Contact the designers by phone / email for a FREE Design & Proof. Pick your size > Add to basket > Design Online > Pay > Receive next working day! Generally speaking banners are not critical to anything greater than 5% and this is considered acceptable with banner printing. 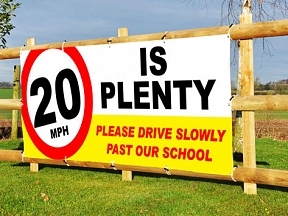 All our PVC banners are 550gsm which means that they are resilient enough to be used outside. 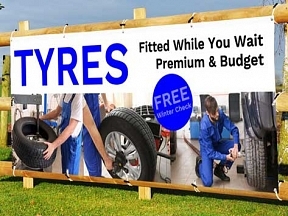 To increase the lifetime of your banners we use ‘Rust Proof’ eyelets, heat welded hem and fully solvent inks, meaning that your banner can cope with harsh outside conditions. Though added corner strength is recommended with this product to prolong its outdoor life. 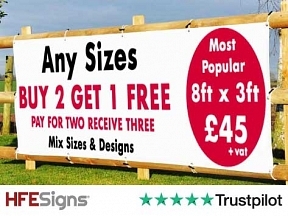 At just £8 per banner regardless of banner size, it is a worthwhile addition. Whether you choose Full Colour or a Mono banner, you can rest assured that you will receive the same high quality product with a high resolution sharp 1440dpi UV stable print. Colour banners can include unlimited colours, logos or photos and we don’t make any additional charges for artwork. Make the most of your display point and grab the attention of passers-by on the street with an eye catching PVC banner. If you are looking for an inexpensive option, our Mono banners are 30% Cheaper! Mono Banners consist of simply black text on a white banner, no images or logos. If you are just looking to get a message or promotion across on a tight budget then Mono PVC banners are a more cost effective option. Choose from Single or Double sided and from any size; use our calculator to configure your banner sizes and specification, remember we do have various PVC banner sizes on special offer. If you are looking to purchase banners with different artwork printed on them you will have to add your banners to your Shopping Cart separately, selecting the correct design for each individual banner. If, for example, you require two 8ft x 3ft banners with different artwork, you add just one banner to your ‘Shopping Cart’ and then click ‘Continue Shopping’. Then simply go back to the product page (banners for this example) and add one banner again, your ‘Shopping Cart’ will now contain two individual 8ft x 3ft banners, this allows for two artwork requirements. This can be repeated for the mixed quantity you require. If you are looking for multiple of the same banner then simply adjust the quantity when adding to your Shopping Cart. 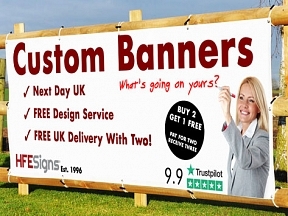 Delivery is FREE of charge for two or more banners ordered and delivered together to the same UK mainland add. Your banner artworks can be different and so can the sizes, in fact you can order a cheap 4ft x 2ft mono banner to save yourself paying delivery!